In attempting to squeeze out that last bit of potential output from the Ford Y-Block (and other engines), there are those items that can be applied that may not be immediately measurable but they will be done because they will not be detrimental to the power output. One of these items is spark plug indexing which tends to vary in its benefit depending upon the application it is being applied. 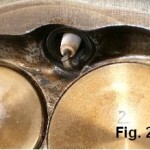 Indexing the spark plugs simply insures that the spark plug ground electrode is in a specific orientation within the cylinder to promote a more beneficial flame front when the fuel is ignited. 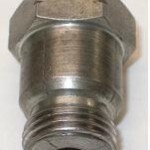 In those cases where detonation is a risk, spark plug indexing is of a proven benefit in that the flame front will not be split by a worst case scenario of the spark plug electrode being in a position to divide the flame path. Indexing also allows the ground electrode or strap to be intentionally positioned away from the higher heat areas it would be subjected to if randomly placed closer to the piston and/or exhaust valve which can increase the propensity for pre-ignition. In a normal situation where a set of spark plugs are randomly installed, the spark plug straps end up running at a variety of temperatures simply from the random placements of the straps. In this case, indexing would provide a more accurate visual means towards optimizing jetting and ignition timing by eliminating potential variances in the spark plug readings themselves. And if running a domed piston that’s marginally close to the spark plug, then indexing also helps in preventing the ground electrode from contacting the piston and potentially closing the gap. 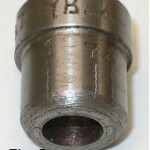 Because both the spark plug threads in the Y heads and the threads on the spark plugs themselves are randomly machined in relation to the ground electrode attachment, the spark plug strap orientation will also randomly install in a myriad of positions within the combustion chamber. 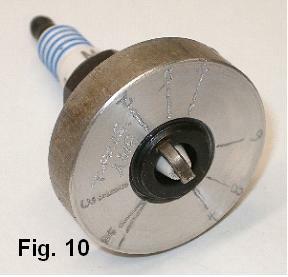 To install a sparkplug so that its ground electrode is in a specific position within the combustion chamber will require trying several spark plugs in a given hole until the desired orientation is achieved. 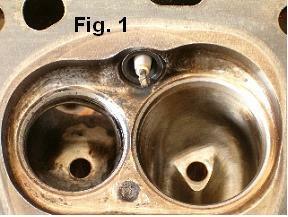 If the heads are off the engine, it’s simply a matter of observing the electrode position and trying different spark plugs in a particular hole until the electrode resides in the desired position when tightened (see Figs. 1&2). If the heads are on the engine, then the spark plug porcelain can be marked with a magic marker stripe that aligns with the ground strap where it attaches to the base of the spark plug. 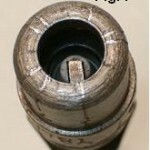 This spark plug is then installed and tightened in the various spark plug holes until the stripe or mark falls into the desired position (see fig. 3). 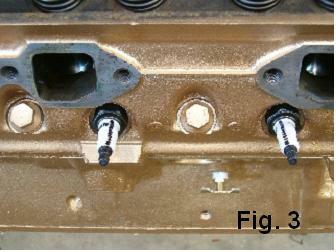 This process is continued until all the cylinders have an ind exed spark plug specific to each cylinder. It will not be unusual to use more than a full set of spark plugs in order to have enough to properly index all eight cylinders. The spark plugs that will not index or align for a given set of heads can potentially work on another set of heads though so just label those as not fitting a specific set of heads so they are not re-ran through the same process at a later date on the same set of heads. So just where is the optimum orientation of the electrode?. 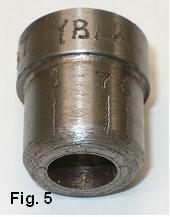 For the Ford Y-Block, the electrode ground strap will be at the highest position in the combustion chamber where the center tip is fully exposed to the oncoming piston and the compressing fuel mixture. 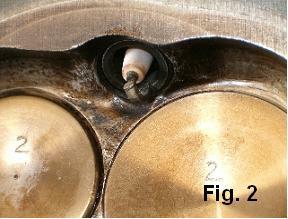 If taken one step further, then the electro de strap will be angled slightly towards the intake v alve so that the strap is intentionally placed further from the exhaust valve (see Figs. 1,2&3). This promotes some additional cooling of the spark plug strap as the intake charge enters the cylinder while also keeping the strap itself again cooler by not being as close to the exhaust flow leaving the engine. The opposing thought process to this is to angle the electrode attachment towards the exhaust valve to promote some additional intake air flow. Regardless on what you decide for the final placement, just be consistent in the methodology or thought process that you use. It ends up being quite an effort to go through the process of installing that first set of indexed spark plugs. But there is a way to capture this information so that future changes of spark plugs can be made and properly indexed without having to go through the process of checking each spark plu g in each respective spark plug hole again. All that’s needed now is a fixture that the indexed spark plug from each cylinder can be installed in and the location of each ground strap attachment position is recorded on to indicate the cylinder for which it belongs. 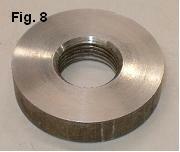 What has been found to be expedient and not requiring a lot of fabrication is to simply use a spark plug anti-fouler (Fig. 4) as the basis for a tool to accomplish this. 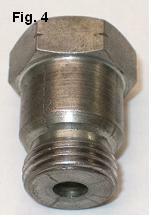 In order to make this work, each indexed spark plug is removed from its respective cylinder in the heads, installed in the anti-fouler, and the location where the ground strap or electrode is attached to the spark plugs base is marked and recorded on the side of the anti-fouler. 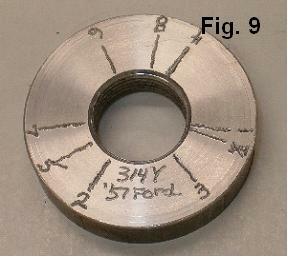 Personal preference is to use a metal engraver to insure the marks are permanent. 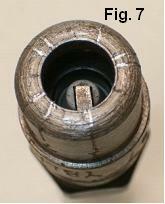 To make it easier to see the spark plug’s ground strap, the hole in the bottom of the anti-fouler is made larger (Fig. 5 & 7). The next time a set of spark plugs is needed, the new plugs are simply screwed into the ‘tool’ and by viewing the ground strap attachment, the ‘best fit’ cylinder number marked on the tools side will indicate exactly which cylinder will get that particular spark plug. If the ground strap aligns perfectly with the mark, then you’ve got an exact fit. Again, you’ll likely need more than eight spark plugs to make a ‘perfect’ set for your Y engine. 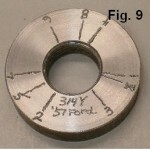 When the tool has outlived the set of heads i t was originally marked for, it can be simply remachined to give a new surface on which to mark a new set of spark plug locations. 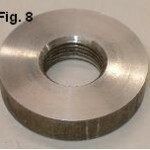 Another ‘tool’ option is to simply take a flat piece of material and drill and tap it to accommodate a spark plug being screwed into it (Figs. 8,9,10). The spark plugs that have already been indexed within a given pair of heads can then be removed one at a time from their respective cylinders, installed in this new tool, and the electrode strap locations marked on the tool as to the cylinder that particular spark plug belongs. Like with using the anti-fouler, any new spark plugs can then be installed in this tool and you will know immediately for which cylinders the new spark plugs will be suitable for.